The Greater Haverhill Chamber of Commerce is pleased to announce the winner of the 2016 Jerry Loy Outstanding Director Award. The Jerry Loy Outstanding Director of the Year Award is presented to an individual from the current Board of Directors who goes above and beyond in their efforts to support the chamber’s mission. This year this award will be presented in response to unparalleled dedication of time, donation of personal resources and continued leadership efforts. 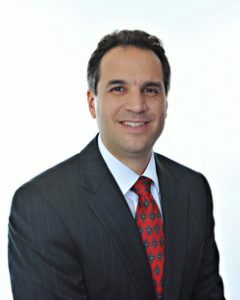 Paul Magliochetti, Sheehan, Schiavoni, Jutras & Magliocchetti, P.C., will receive the award for his ongoing leadership with the Executive Committee, expertise in the area of business law and regulations, and recent guidance in real estate and matters surrounding non-profit entity formation. Magliocchetti will be honored at the 2016 Annual Dinner & Awards Ceremony on Thursday, June 2, 2016 at 6:00 P.M. at Renaissance Golf Club. Reservation may be made by contacting the Chamber office at (978) 373-5663. Additional information may be found at www.haverhillchamber.com. Once again we congratulate Alan Boisvert and Jean McCann on their accomplishments. In 2010 Paul became a Director with the Greater Haverhill Chamber of Commerce, and last year was elected to the Executive Committee. SSJM has also been host, sponsoring an open house after hours event at the Haverhill office last fall and welcoming guests to the firm at the recent Coffee with the CEO breakfast. Acting as an advocate, Paul through the practice takes time to introduce new businesses to the Chamber and let them know about the benefits it provides within the community.